The society's journal Nomina (ISSN 0141 6340) is published annually. All submissions are subject to a rigorous and anonymous peer review process. The editor from volume 38 is David Parsons, and the the editorial board consists of John Freeman, Alison Grant, Carole Hough, Peter McClure, Kay Muhr, Oliver Padel, and Maggie Scott. Instructions for submissions are in the Nomina style-sheet. Items for inclusion in the annual Nomina bibliographies may be sent to biblio at the domain snsbi.org.uk. Below is the table of contents for all issues. The same data is available as a bibtex file for use with automatic citation software; and as a fully typeset pdf file, the latter sorted by author. Most papers from volumes 1 to 34 are available for free download as pdf files — look for the “pdf” indication on the left-hand side of this webpage, before the page number. 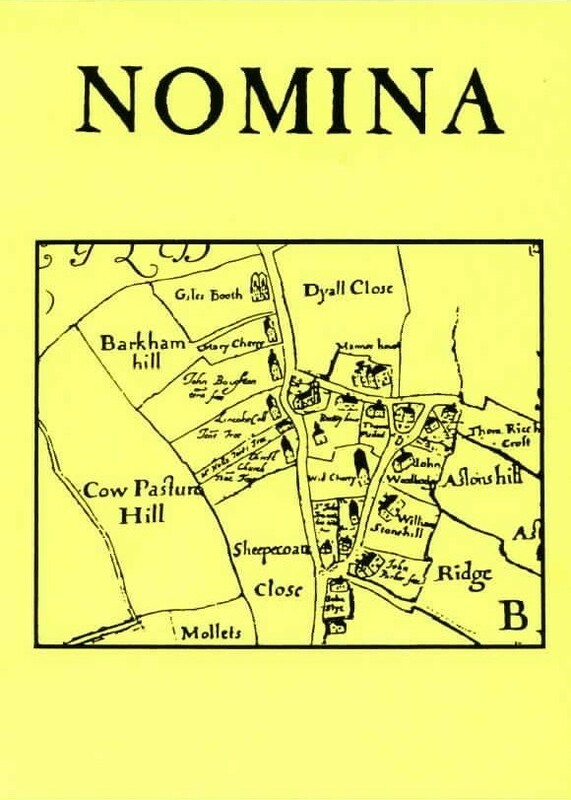 Back issues of Nomina (price on application) may be obtained from from the distributor Shaun Tyas (shaun at shauntyas.myzen.co.uk), or by writing to: Shaun Tyas, 1 High Street, Donington, PE11 4TA, UK. 33 Peter McClure English topographic surnames with fused Anglo-Norman preposition and article: myth or reality? 73 Simon Young What is a Boggart Hole? pdf 61 Alaric Hall Are there any elves in Anglo-Saxon place-names? pdf 5 Anthony R. Rowley Elslack-Olenacum: an onomastic relic of pre-Roman Britain? 189 Work in Progress by Anon. pdf 89 Gillian Fellows-Jensen John Aubrey, pioneer onomast? 201 Work in Progress by Anon. 189 Notes for Contributors by Anon. pdf 169 Peter R. Kitson Review article: Gillis Kristensson, A Survey of Middle English Dialects 1290–-1350: The East Midland counties (Lund UP, 1995), xiv + 199 pp., 16 maps. pdf 41 Gillian Fellows-Jensen Scandinavians in southern Scotland? pdf 89 Mary C. Higham Shay Names - A need for re-appraisal? pdf 123 Alexander R. Rumble A Bedan gloss on Bedfont, Bedwell, etc. pdf 7 Cecily Clark Willelmus Rex? vel alius Willelmus? 206 Notabilia and Personalia by Anon. 212 Additional Standard Abbreviations: Mainly Scottish. Supplement to `Notes for Contributors', by Anon. 214 The Council for Name Studies in Great Britain and Ireland by Anon. 210 Notes for Contributors, by Anon. 216 The Council for Name Studies in Great Britain and Ireland, by Anon. pdf 73 Richard Coates Coldharbour - for the last time? 134 Work in Progress by Anon. 140 The Council for Name Studies in Great Britain and Ireland, by Anon. 113 Alexander R. Rumble C. Stella Davies & John Levitt: What's in a Name? pdf 67 Gillian Fellows Jensen Common Gaelic Áirge, Old Scandinavian Ǽrgi or Erg? This list was autogenerated by ~/Nomina-1.0/txt_to_SNSBI_website_raw_include_00.py from the master file ~/Nomina-1.0/Nomina_contents.txt at 2019-03-23 09:58:26.